So leading up to our vacation this summer, I really wanted to get myself in shape so I could feel good about myself. I signed up for a virtual challenge through a friend of mine which emphasized being physically active and eating clean. I was a little hesitant about the clean eating part of it (it has nothing to do with the 5 second rule people) and while it’s not necessarily always going to be something sustainable for me personally, it really challenged me to find some new recipes and gave me a new outlook on food and how it fuels my body. I found Pinterest to be a great resource for inspiration, which lead me to one of our new favorites – even when we aren’t aiming to eat clean! 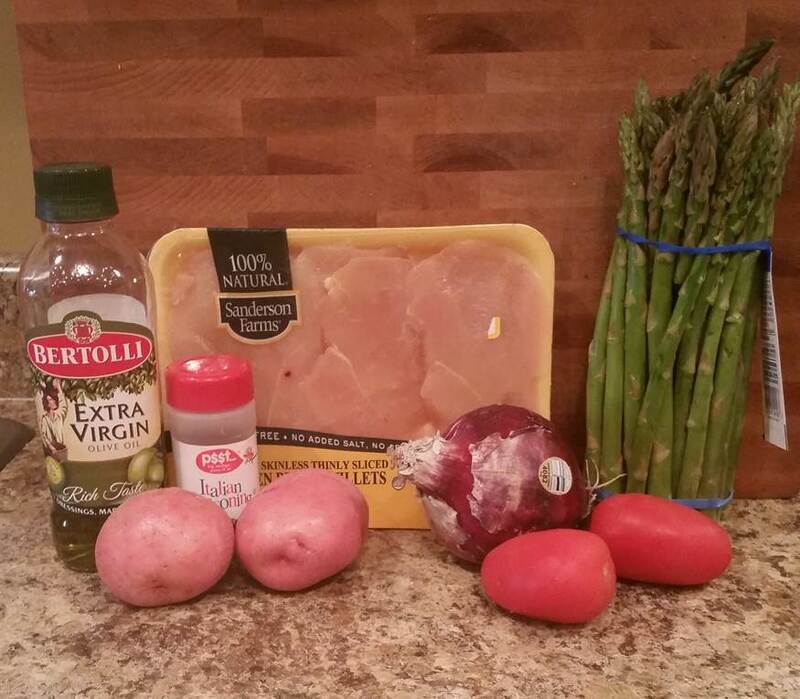 It is my go-to recipe for a crazy weeknight when I have other stuff to get done – like preparing other meals for the week or getting a workout in. It’s filling and packed with protein and flavor. It takes 10 minutes to prep! Oh, and the best part? It only takes 1 dish. You chop everything, throw it in a dish, stir it and bake it. No messy bowls, pots and pans to worry about – just the dish you cook it in. Quick (and you can get other stuff done while it cooks) – check! Preheat oven to 400. Spray a large baking dish with non-stick spray. 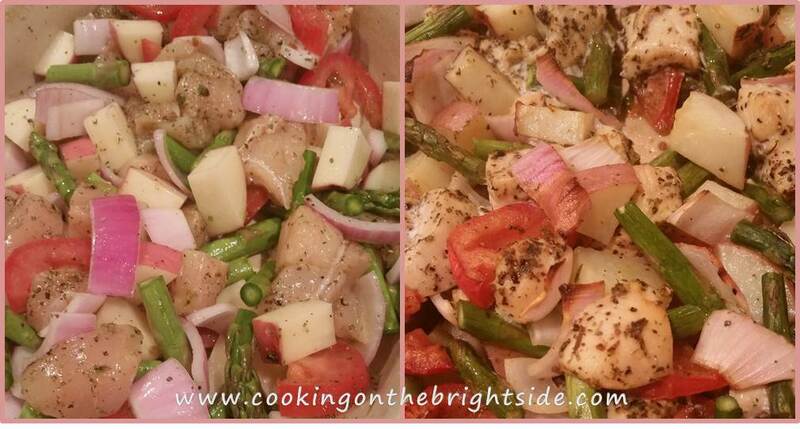 Add chicken and vegetables to your baking dish. Add olive oil, garlic, rosemary, Italian herb seasoning, salt and pepper. Toss to coat. Bake for 30 minutes or until potatoes are tender and chicken is cooked through. Take this 30 minutes to check something off your list. Get in a quick workout. Make your lunch for the next day. Call your mom. Take a bubble bath. Pay your bills – the possibilities are endless people, because your work is done when this thing goes in the oven! I add a side salad…and usually a side of wine too. Let me know if you try this and if you love it as much as we do. 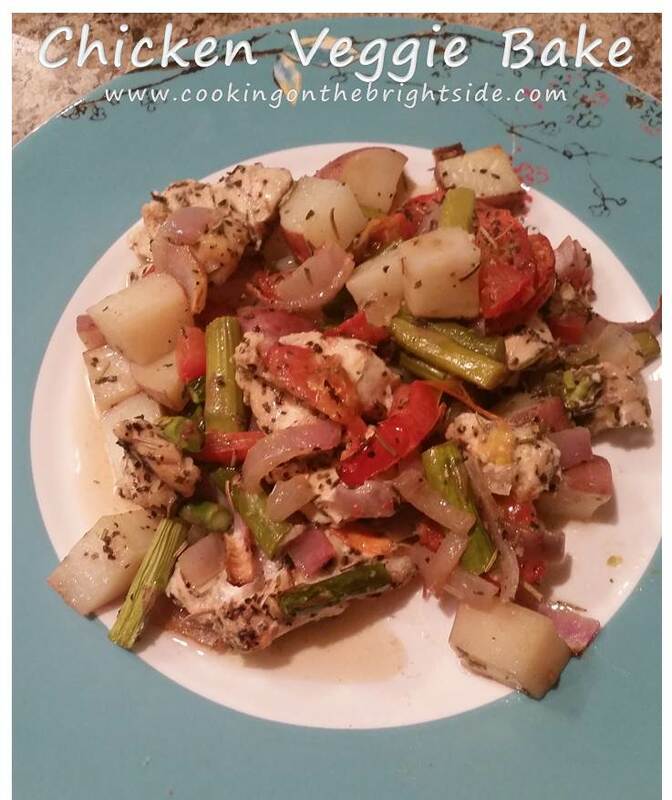 This entry was posted in Chicken, Main Courses and tagged clean eating recipe, Cookingonthebrightside, eat clean recipe, quick chicken recipe, quick weight watchers recipe by cookingonthebrightside. Bookmark the permalink.